f “Mi Caseta – Flamenco Nights” is a wonderful experience that aims to show the Andalusian culture with the best flamenco music and dance, and also through the gastronomy of our land. Our aim is to immerse the public into a magic atmosphere recreated by a carefully settled scenography of an exclusive ‘tablao flamenco’ where you can feel the culture, the magic and the emotion of the tradition and the purest essence of the Andalusian soul. We stand out for the top-quality of our show that is aimed for both international and national tourism. Where? The flamenco show takes place in a traditional Andalusian “caseta” with capacity to receive up to 200 guests and located in the Estepona Fairgrounds in the province of Malaga. A stage of more than 30m² is the main part of the facilities formed by 11 first-rate artists. When? The weekly show takes place every Friday of the year at 21:00. It is also possible to organize special sessions any day of the week for groups over 50 persons. In such case, the schedule of the show could be adapted depending of the request of the group. Dinner To convey the full and true essence of the authentic Andalusian fair, we have prepared a selection of the best and most representative products of the most popular cuisine in southern Spain. Groups have the option to replace some dishes with others. Please contact the show manager in advance. 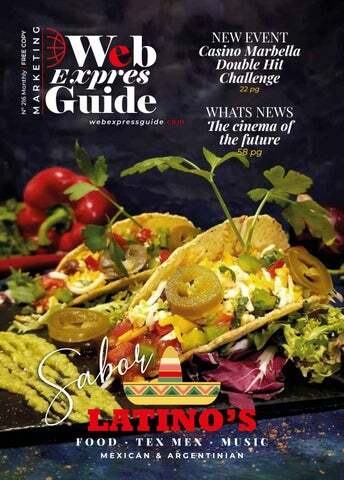 WEB EXPRESS GUIDE © Marbella 29600 - Spain Tel: +34 952 891 773 Mobile: +34 629 504 003 Universal Copyright Registered © 2019 Edwin Gladstone No material contained in this publication may be reproduced or published without the written consent of the publisher. No responsibility is taken for claims made by advertisers; nor are the views expressed in the editorial columns necessarily the views of the publishers. Magazine Distribution Areas: MARBELLA - PUERTO BANUS - NUEVA ANDALUCIA - SAN PEDRO - GUADALMINA - ESTEPONA - SABINILLAS - P:N: GUADIARO - SOTOGRANDE - GIBRALTAR You may also download a free copy of the magazine from our website at www.webexpressguide.com You may share your own view on-line at the end of any article, we shall not publicize your identity or you may send an email to the editor@webexpressguide.com. PLEASE TELL ADVERTISERS YOU HAVE SEEN THEM IN WEB EXPRESS GUIDE.THANK YOU. Your own personal hard copy can be posted to you each month for €20 per year. EDITOR PAGE It only seems like yesterday when I first created Web Express Guide over 20 years ago, however it is now time to start to think of its future. Web Express Guide was the first ever website dedicated to an international Costa. The first website (still is) with its own magazine, with many, many attempts to copy the concept over the years. Although we are the most competitive media on the Costa for price, quality and constant innovation, it is now time to think of its future continuity. For this reason, I am lucky enough to have a son, Sebastian, who will gradually take over the running of the business but with newer and fresher innovation and approach. Some changes can already be noticed in our emphasised range of services as a marketing company. The object is to continue offering an effective, high quality promotional service at the most competitive prices in relation to quality and service provided. Parece que fue ayer cuando creé Web Express Guide hace más de 20 años, sin embargo, ahora es el momento de empezar a pensar en su futuro. Web Express Guide fue la primera web dedicada a la Costa del Sol a nivel internacional. La primera web (todavía lo és) con su propia revista. Si bien somos el medio más competitivo de la Costa en cuanto a precio, calidad e innovación constante, ahora debemos pensar en su continuidad futura. Por este motivo, tengo la suerte de tener a Sebastian, mi hijo, que asumirá gradualmente la dirección del negocio pero con un enfoque y una visión más nueva y más fresca. Algunos cambios ya se pueden notar en nuestra gama de servicios, más enfocada al marketing. El objetivo es continuar ofreciendo un servicio promocional eficaz y de alta calidad a precios competitivos por el servicio prestado. 46. What is the deduction for double international TAXATION? OUR AIM IS TO MAKE SURE YOUR TIME IN SPAIN WILL BE THE MOST ORIGINAL AND MEMORABLE EXPERIENCE IN SPAIN. CHAUFFEUR DRIVEN AIRPORT TRANSFERS Mercedes E-Class or equiv. MERCEDES VAN VIANO or equiv. exican food is DELICIOUS and sophisticated. It has UNESCO recognition for its unique contribution to humanity. Sweet potatoes, yams, tomatoes, vanilla, cinnamon, cacao, amaranth, chilies and maize are just a few of the food groups adopted in Mexican cuisine and people have been cooking with them for a VERY LONG time. exican food is packed with flavour while utilizing the freshest ingredients available. The dishes are appealing to most palates, which is why Mexican is a favourite cuisine in the U.S. and many other nations around the world. When the Spanish arrived they introduced, among other good things, distillation, wheat and cows. The truth is, Mexican food is very healthy because most dishes contain all the food groups. ungent and bursting with flavour, garlic lends special qualities to the final cuisine. Onion, cilantro, oregano, cumin, and chili powder are some of the spices used regularly. Oregano, cilantro and cumin all give a savoury and earthy flavour to the dishes they accompany. LISA INSISTS ON IMPORTING ALL THE BASIC INGREDIENTS FROM MEXICO, STATING THERE CAN BE NO SUBSTITUTE FOR THE REAL FLAVOUR. Mexican way to enjoy the bursting flavours of Mexico. Guacamole is made from a healthy fat that doesn't rack up too many calories. Enchiladas date back to Mayan times, when people in the Valley of Mexico would eat corn tortillas wrapped around small fish. These days both corn and flour tortillas are used and are filled with meat, cheese, seafood, beans, vegetables or all of the above. LATINOS a new and fresh Tex Mex restaurant with an added twist of Argentinian food well worth visiting with a warm welcome from Lisa. With the result that a number of companies, even from abroad, have now entered the market, unfortunately they do not generate their own supplies which they purchase from the main Spanish electrical company and still have to use the same cables and electronic meters as supplied by Endesa. The actual saving they offer can only be minimal. Do you think you are paying too much for your electricity? Does your electric bill make sense? Can you understand it? Are you getting too many power surges that can damage your equipment? Are you getting sudden power cuts without warning? Do you find you lack adequate power for your household? Do you find that your complaints are not dealt with adequately? We can show you how to generate your own electric power, save on price of electricity, at a cost you can easily afford and control you own supply with no dependence on others. REAL ESTATE! Le Vack Estates started in London, Essex, where they have sold several of their own developments and a broad range of other properties resulting in a very high level of customer satisfaction. Now, they have also located in SanLuis de Sabinillas, in the province of Malaga, where they offer properties over the whole Costa del Sol. The objective of the company is to provide a complete package for clients so as to ease the entire process. With English and Spanish speaking staff, the communication provides the best service available at unmatched rates. Guacamole I t i s v e r y s i m p l e a n d ve r y t a s t y. Ju s t w h i p t o g e t h e r t h i s d e l i c i o u s b l e n d o f yo u r f avo u r i t e f re s h i n g re d i e n t s .
1. Mash avocados with garlic and salt. Stir in remaining ingredients. This deliciously typical Italian Cafeteria, located in a charming square in Estepona, in addition to the ambience it provides the very authentic Italian coffee, cappuccinos, delicious crêpes and a variety of paninis. ALSO SMOOTHIES AND COCKTAILS, WITH FRESH FRUIT. All genuinely, 100% manufactured on the premises to own Italian recipe every morning. Pâtisserie Belge Fresh home-made daily cakes and pastries Savour and enjoy our fine and delicate pastries with one of our many choices of coffee, or take some home to indulge with your family and friends. As if this were not enough, the tournament will also have a satellite price the day before the tournament also with unlimited reentries. That is on May 9, 2019 at 20:40 hrs with a buy in of € 45 and 10,000 points. In addition, players will accumulate their points on both days to reach a stronger final of the tournament. The grand finale will be on Sunday May 12 at 6:00 pm and promises to offer quality and adrenaline at all times. The collaborating hotels join in to form part offering accommodation discounts to the participants. Genomic Testing in Breast Cancer The analysis of activity in certain groups of genes that can influence the way cancer will behave and respond to treatment. What is genomic testing? It describes laboratory tests which are performed on the patient’s tumour samples, either a biopsy or the whole piece is removed during excision. Using modern techniques, key genes are isolated and examined for protein synthesis helping us to understand the true behaviour of the disease (prognosis), and even possible weaknesses that make it more sensitive to specific treatments (Targeted Therapy). What are the differences between genomic testing and genetic studies? Genomic platforms or test are studies performed on specimen os the tumour or tumour to check for gene alterations. There are several types of commercial platforms for Breast Cancer including MamaPrint (70 genes), Oncotype (21 genes) and Prosigna (50 genes). Normally they provide information on the actual Breast Cancer subtype and the prognostic risk of recurrence, especially in patients where there are doubts regarding whether to administer chemotherapy after surgery. Genetic testing of individuals or their families involves studies on normal cells in healthy people, or those with the disease, normally taken from a blood sample, which are used to identify inherited genes which predispose to developing a certain type of Cancer. There is a variety of genes being studied but the best known in Breast Cancer are the BRCA1 and BRCA2 genes which predispose families with the mutation to develop Breast as well as Ovarian Cancer. How do these tests help doctors in decision making when dealing with breast cancer? Which patients can have this test? Genomic platforms are studies which are performed on samples of tumour (biopsy or excised piece) enabling us to have a very accurate idea of their gene map and gene alterations. This gives us a much clearer idea of the prognosis and possible treatment than when we only possess conventional clinical data. In breast cancer its use is widespread in women following initial surgery and who are in the early stages of the disease, with no or very few affected lymph nodes (1-3) and who also have obvious hormone sensitivity (positive hormone receptors in the tumour cells). In these patients the result (High, Medium or Low risk) enables the decision to be made as to whether adding Chemotherapy to the treatment would be more beneficial, therefore decreasing the risk of recurrence of the disease. A genomic platform is especially useful when the possible benefit of adding Chemotherapy (with the toxicity and deterioration in quality of life it causes) to surgery is in question in patients with Breast Cancer who have had surgery at initial stage. What type of tests are performed in HC? When suggested by the oncologist, at our centre we have access to all the commercial genomic platforms approved for Breast Cancer as well as broader platforms such as Foundation One which includes other types of tumour, whatever their origin. It also allows the tumour to be categorised in one of 5 different Breast Cancer gene classifications, each having a different prognosis and distinct therapeutic approach. +34 952 001 100 Comprehensive and personalized real estate service for individuals and investment groups. To be known on the Costa you need to advertise your message all the time because PEOPLE COME AND PEOPLE GO CONSTANTLY Too many social media pages with announcements of short duration are time consuming for limited exposure. Unless you can afford to advertise on National Radio and Television Channels your audience is limited to a few locals and only sometimes. Unless you are as well known as Johnnie Walker or Pepsi Cola driving past large signs on the roads is not the answer. Too many cheap publications promoting illegal businesses, leaflets and means to save money cannot have the desired effect on the desired market. PRINTING IS YOUR BEST ANSWER BUT... Newspapers are expensive, they are not designed to target/reach your desired consumer, they do not represent the quality of your business and they mix your business with too many others including competitors. Quality, expensive looking magazines are a good option but the cost is high and they do not justify the return. Учимся курить заново или бросаем? The firm Le Vack & Marín offers comprehensive and personalized tax advice to companies, professionals and individuals. Our team of professionals has extensive experience and specialized knowledge in the tax area which allows us to meet any customers’ need and to offer high value budgets..
"No hací a falta pen sárselo dos quería form veces ar parte d e esto." años en Nueva York (no en vano representa una de las mejores experiencias de mi vida), que gracias a ello crecí como persona y como profesional. Pasados estos años, sentí una pasión increíble hacia el mundo empresarial; así que, qué mejor manera de involucrarse en él que trabajando para la propia empresa de mi padre, Web Express Guide, al que admiro sobremanera, lleva establecida más de 20 años en la Costa del Sol a día de hoy, promocionando negocios y a profesionales sin descanso. No hacía falta pensárselo dos veces: quería formar parte de ello. The Story Like the previous season, it largely consists of original content not found in George R. R. Martin's A Song of Ice and Fire series and adapts material Martin revealed to the showrunners about the upcoming novels in the series, The Winds of Winter and A Dream of Spring. The season was adapted for television by David Benioff and D. B. Weiss. Like the sixth and seventh seasons, season 8 is based on an outline of the two final, presently unpublished, novels in George R.R. Martin. The final season is set to be the most explosive and Ser Jorah Mormont star Iain Glen has suggested that there will be feature-length episodes, making it one of the longest runs ever - if not the longest. The confrontation between the White Walkers and humankind will include the series’ biggest battle to date. The crew spent 55 night shooting outdoors for the battle scenes at Winterfell alone, Entertainment Weekly reports. Afterwards, they moved to a studio and continued filming the same battle for weeks later. All cast members whose characters survive the events of Season 7 are expected to be back for Season 8. The main exception is Indira Varma (Ellaria Sand), who confirmed her role has ended even if Ellaria's exact fate is somewhat ambiguous. The budget is $15 million per episode. The first episode has a run time of 54 minutes the second 589 minutes, the third 82 minutes, the fourth 78 minutes the 5th and 6th 80 minutes each. Season eight will be airing on HBO in the US on Sunday, April 14. Sky Atlantic and NOW TV in the UK will be airing season eight on Monday, April 15 at 2am. EXCELLENCE IN CONTRAST AND BRIGHTNESS ELITETRONIC OFFICIAL DISTRIBUTOR Ctra. Nacional 340 km. 135 11312 Torreguadiaro SOTOGRANDE - 956 615 694 ‘Sony’ and their logos are registered trademarks or trademarks of Sony Corporation. All other logos and trademarks are the property of their respective owners. While the cost of a standard british funeral now sits at just under ÂŁ4,300, and rising twice as fast as the cost of living. n previous editions we have shown that funeral costs in UK have even come under scrutiny of the government due to aggressive and misleading sales tactics, while the cost of a standard British funeral is rising twice as fast as the cost of living. Funerals are considerably cheaper in Spain, but even so, costs do go up over time due to the inevitable inflation. This is why it is worth planning to fix the cost at present rates. The additional advantages are that you can make all your wishes known having a say in yourÂ final send-offs, plus your family will not have to shoulder the cost at a most distressing time. Many elderly people obviously plan their funeral in advance; but do you really need to wait until the last moment to make this important decision? It is a bit like insurance, the younger you are the cheaper is the premium; so why wait? Anyway a single cost is cheaper than a monthly premium. Unfortunately the lower costs in Spain have attracted many non-Spanish, unlicensed funeral companies, therefore it is important that you deal with a reputable Spanish funeral directors such as Francisco Camero who have provided their services for three generations and are also recommended by the UK Foreign Office. Suffice it to say, there are no foreign licenced undertakers in Spain and you should ensure that third party disbursements are included in the original price to avoid you or your familyÂ paying more than was planned. Whatever religion or nationality your loved ones will always find us to be very understanding and helpful when they are most vulnerable at a distressing and delicate time. Burials, Cremations, Chapels of rest, Services in any language and religion, Repatriation Abroad, Transfer to other communities. ome countries sign treaties according to certain rules to prevent double international taxation to avoid tax payments being made in both countries. Residents of any EU country must declare their worldwide income and pay the due income tax in the respective country. But this is in conflict with the other rule which states that tax should be paid in the country where the income in generated. To resolve this situations countries sign double taxation treaties. The following study case may help to understand this better. A national of an EU country residing permanently in Spain where his income is generated and covered by the double taxation treaty. Additionally, he owns a property in his home country which he rents. He also has some investments in his home country and he received dividends. His country asks him to file a tax for the rental income. Having informed his investment’s broker that he resides in other country, tax is not withheld when receiving his dividends. In Spain, he needs to declare all his worldwide incomes: the incomes coming from his work in Spain, his rent revenues and the foreign dividends. By virtue of the double taxation treaty, Spain will acknowledge the tax payment for the rent revenues and apply a deduction for double international taxation, effectively cancelling tax derived from those incomes. Because no tax was deducted on the dividends, the charge for this will be taxed in Spain. l mundo de la moda emana arte y savoir faire, tanto que las grandes firmas apuestan por ilustradores únicos que plasman su filosofía a través de dibujos que son pura magia. Gucci, Dior o Prada son algunas de las marcas que confían en el trabajo de talentosos artistas para plasmar sus ideas en lienzos. En otras palabras, podríamos decir que detrás de una gran firma se esconde un magnífico ilustrador y estos son los más deseados del momento. l arte de Alice Shirley se plasma en la última colección de pañuelos de Hermès. Hechos en cashemere y seda, la maison francesa no ha dudado en contar con el trabajo de la artista para dar color y originalidad a esta pieza tan clásica. Graduada en la Central St. Martins en 2007, Alice traslada su pasión por la naturaleza en dibujos únicos y llenos de personalidad. ior, Louis Vuitton, Kartell, J.W. Anderson, Christian Louboutin... Ignasi Monreal es uno de los ilustradores más queridos y respetados a día de hoy, y su relación con el mundo de la moda es más que evidente. Este barcelonés es, además, el encargado de dar vida a una de las campañas más míticas de Gucci: la colección Primavera-Verano 2018 donde todos los diseños se plasmaron al más puro estilo Alessandro Michele. ucci ha demostrado ser una firma muy unida al mundo del arte, y así lo demuestran todas y cada una de las colecciones de Alessandro Michele. Las calles de medio planeta se empapelaron de la campaña 'Gucci x Unskilled Worker', donde la artista Helen Downie mostraba su propia visión de la fantasía que está sumida la casa italiana. de Primavera-Verano 2013 decidió optar por la originalidad. Con las ilustraciones de la artista la maison confió en una campaña a base de muñecas de papel con sus diseños de la temporada para cambiar al gusto de cada una. de leche necesitaremos leche y nódulos de kéfir. Lo más adecuado es introducir en un bote de cristal los nódulos de kéfir. Por cada cucharada de estos nódulos añadiremos tres cucharadas de la leche dejando un tercio del bote vació. Este bote debe dejarse reposar unas 24 horas a temperatura ambiente y, pasado este tiempo, colar los nódulos y quedarnos con el producto resultante. Propiedades del kéfir El hongo del kéfir contiene ciertas propiedades que le permiten modular nuestra flora intestinal, y ofrecernos beneficios inmunológicos. Es alto en bacterias vivas beneficiosas para nuestro intestino precisamente esto lo que lo convierte en un estupendo probiótico. No solo eso, sino que mejora nuestra capacidad de digerir las proteínas y de sintetizar vitaminas. No es de extrañar que se considere un superalimento de lo más funcional y esté en boca de todo el mundo. DE AGUA: En cuanto al kéfir de agua el proceso es similar: necesitamos tres cucharadas de nódulos para un litro de agua de botella para que no contenga cloro. Podemos añadirle un poco de panela para endulzarlo, pero es mejor no usar miel en ningún caso. En este caso, en vez de 24 horas lo dejamos 48 horas, abriendo ocasionalmente el bote y, pasado ese tiempo, tenemos listo el kéfir de agua. On a very sad note I am sorry to have to report the unfortunate departure of Juan Miguel Fernandez. Not just a well-respected Rotarian but the founder and motivator of two Rotary Clubs, including the Estepona-Sotogrande International. Always ready to help and do what he could for any member or any project. He will be greatly missed by every Rotarian who knew him. n a brighter note, at the last meeting on 4th April, it was announced that more than 100 children from the Colégio Aleman de Málaga have taken part to two successful events organised by this club with the sponsorship of the Rotarian Foundation with the object of promoting respect and understanding of the environment. Days Gone is an action-adventure survival horror game set in a post-apocalyptic open world, played from a third-person perspective. The player controls Deacon St. John (Sam Witwer), a former outlaw-turned-drifter and bounty hunter who prefers life on the road to wilderness encampments. The game takes place two years after a global pandemic occurred which killed almost all of humanity, and transformed millions of others into “Freakers”, mindless zombie-like creatures that are quickly evolving. Developer: SIE Bend Studio Publisher: Sony Interactive Entertainment Platform: PlayStation 4. Release: April 26, 2019 Mode: Single-player. The Cinema of the Future By bringing the visual power of LED picture quality to the big screen, viewers get a more powerful, compelling and memorable content. he LED technology in the cinemas is not limited to achieving more vibrant colours, the idea is to create an immersive experience that encourages you to go to the cinema instead of watching TV at home. LED technology and that it reproduces in HDR and 4K is something new for cinemas. And you get a complete experience because "there is only one in Spain with 514 speakers and 217 amplifiers”. ecause the image is broadcast directly from the screen, the projection room disappears, so the cinema can expand its number of seats. As it is a modular system, maintenance is easier, because only the module that failed and not the screen needs to be changed. more colour, more black, more details Itâ&#x20AC;&#x2122;s not that the black is blacker, itâ&#x20AC;&#x2122;s the colours that are brighter, the screen barely loses intensity even when the lights are on, and the details and textures are even more accurate than what is achieved with the new laser projection screens. The effect is very noticeable. The quality of the black shades is overwhelming, and when combined with such a powerful sound system, you can feel the whole thing going through you as if you were really inside the movie. SYNOPSIS: We all have a superhero inside us, it just takes a bit of magic to bring it out. In Billy Batson’s case, by shouting out one word SHAZAM! - This streetwise fourteen-year-old foster kid can turn into the adult superhero Shazam. SYNOPSIS: Based on the absurd but true 1973 bank heist and hostage crisis in Stockholm that was documented in the New Yorker as the origins of the ‘Stockholm Syndrome’. SYNOPSIS: Pet Sematary follows Dr. Louis Creed, who, after relocating with his wife Rachel and their two young children from Boston to rural Maine, discovers a mysterious burial ground hidden deep in the woods near the familyâ&#x20AC;&#x2122;s new home. All types of handmade iron work undertaken. Call us for a free estimate. A professional company established on the Coast for more than 15 years. Gibraltar’s Best Sotcked English Cookshop! SACARELLO’S ALSO OFFERS A VARIED COMPREHENSIVE HOMEMADE LUNCH MENU WITH A BALANCE OF TRADITIONAL ENGLISH DISHES. WE GUARANTEE HIGH QUALITY, CONFIDENTIALITY, DISCRETION AND PUNCTUALITY. A professional and highly qualified team with years of experience in providing accurate & qualified translations to and from more than 40 languages.. The Mercedes SL is one of the Classic models from the Stuttgart brand. It's about a convertible two-seater measuring 4,631 mm in length, at the top of the cabrio range within the classic Mercedes, although it would be fair say that it shares that position with the Mercedes-AMG GT Cabrio, a model with a much more radical approach. El Mercedes SL es uno de los modelos clásicos de la marca de Stuttgart. Se trata de un descapotable biplaza de 4.631 mm de longitud que es el tope de gama cabrio dentro de los Mercedes clásicos, aunque sería justo decir que comparte ese trono con el Mercedes-AMG GT Cabrio, un modelo con un enfoque mucho más radical. Even at its most extreme versions signed by AMG, we can consider that the Mercedes SL is still a Gran Turismo Roadster and more than a pure, hard sports car, where no sight is lost for comfort however much power there is under the bonnet. Incluso en sus versiones más extremas firmadas por AMG, podemos considerar que el Mercedes SL sigue siendo un Gran Turismo Roadster más que un deportivo puro y duro, en el que la orientación al confort no se pierde de vista en ningún momento por mucha potencia que dispongamos bajo el capó.